So the researchers questioned 789 Canadian students about their drinking in the previous month and the hangovers they experienced, finding that those who didn't get a hangover simply consumed "too little alcohol to develop a hangover in the first place". "The more you drink, the more likely you are to get a hangover. "Drinking water may help against thirst and a dry mouth, but it will not take away the misery, the headache and the nausea." "Research has concluded that it's not simply dehydration - we know the immune system is involved, but before we know what causes it, it's very unlikely we'll find an effective cure." "Whilst further research is needed, this new research tells us that the answer is simple - drink less." The paper is presented at the European College of Neuropsychopharmacology conference. What strategies do people use when they have drunk too much alcohol? Find out why alcohol can make you feel awful the morning after. 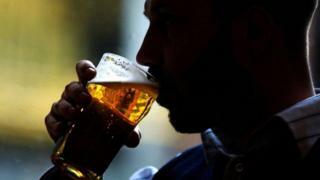 BBC iWonder - How can I avoid a hangover? Can a pill cure hangovers?